But you don’t have to believe me. Folks on the left openly admit that a VAT is necessary to make America more like Europe. Check out these excerpts from an article in Foreign Affairs by Professor Lane Kenworthy of the University of Arizona. He explicitly wants bigger government and recognizes the VAT is the only way to finance a European-sized welfare state. …modern social democracy means a commitment to the extensive use of government…U.S. policymakers will recognize the benefits of a larger government role… Americans will need to pay more in taxes. …The first and most important step would be to introduce a national consumption tax in the form of a value-added tax (VAT)… Washington…cannot realistically squeeze an additional ten percent of GDP in tax revenues solely from those at the top. Pay special attention to the final sentence in that excerpt. Kenworthy is an honest statist. He knows that the Laffer Curve is real and that taxing the rich won’t generate the amount of revenue he wants. 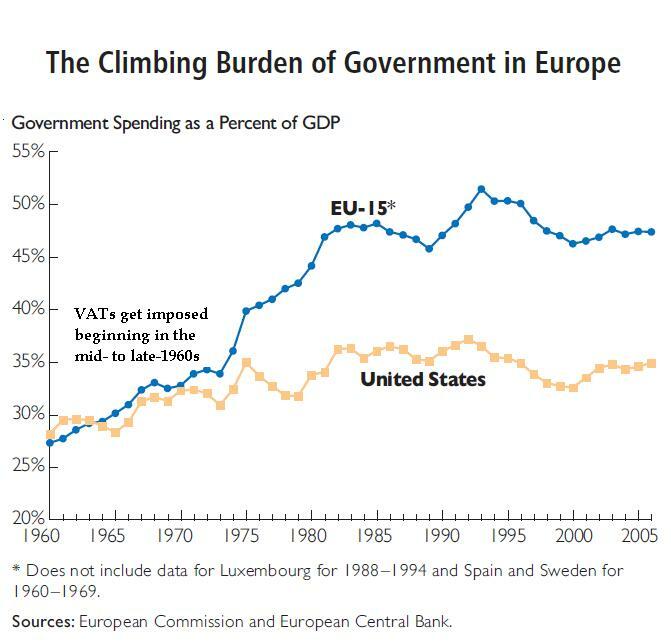 That’s why the VAT is the key to financing bigger government. Heck, even the International Monetary Fund inadvertently provided very powerful evidence that a VAT is the recipe for bigger government. Want more proof? Well, check out the recent New York Times column by John Harwood (the same guy who was criticized for being a biased moderator of CNBC’s GOP debate). He starts by pointing out that Senators Cruz and Paul are proposing European-type value-added taxes. Senator Ted Cruz of Texas and Senator Rand Paul of Kentucky do it most explicitly by proposing variations on “value-added tax” systems used by European countries. But here’s the part that should grab your attention. He cites some folks on the left who admit that there’s no way to finance big expansions of the welfare state without a VAT. Democratic economists…say…income trends…complicate their ability to raise enough revenue to finance government programs without increasing burdens on the middle class as well as the affluent. “We’ve come close to maxing out the amount of progressivity we can get from the existing tax system,” said Peter Orszag, President Obama’s first budget director. …as looming baby boomer retirements promise to swell Social Security and Medicare expenses beyond the current tax system’s ability to finance them, is in new thinking that expands the scope of possible solutions. “There’s no way we can keep the promises we’ve made to senior citizens and others without a new revenue source,” said Mr. Burman of the Tax Policy Center. So if the statists are salivating for a VAT to make government bigger, why on earth are some otherwise sensible people pushing for this pernicious new tax?!? Some journalists have asked this same question. Here are some passages from a Slate report. …conservative policy thinkers…worry that it might accidentally set the stage for much, much higher taxes in the future should Democrats ever take back control of Washington. …Cruz would impose a new, roughly 19 percent “business flat tax.” This is his campaign’s creative rebranding of what the rest of the world typically calls a “value-added tax,” or VAT. And…it scares the living hell out of some conservatives. The article notes that Cruz and Paul have decent intentions. …for Cruz—and for Rand Paul, who…would similarly like to combine a VAT and flat income tax—the main appeal is that it could theoretically raise a lot of money to finance tax cuts elsewhere. But good intentions don’t necessarily mean good results. And just like you don’t give matches to a child, you don’t give a giant new tax to Washington. How much could Cruz’s proposal net the government? The conservative-leaning Tax Foundation thinks $25.4 trillion over 10 years. … in the hands of a Democratic president, it could become a hidden money-making machine for the government. Passing a national sales tax would be hard, they say. But once it’s in place, slowly ratcheting it up to pay for additional spending would be relatively easy. “To be blunt, unless there’s a magic guarantee that principled conservatives such as Rand Paul and Ted Cruz (and their philosophical clones) would always hold the presidency, a VAT would be a very risky gamble,” Daniel Mitchell, a senior fellow at the libertarian Cato Institute, wrote recently. …The ironic thing here is that Ted Cruz, anti-tax preacher, may be doing his best to craft a tax plan that leaves Americans in the dark about the actual cost of running their government. Simultaneously, he might be making political room for Democrats to start talking about a VAT tax of their own. By the way, this isn’t the first time that a Republican has broached the idea of a VAT. One of the worst Presidents in American history, Richard Nixon, wanted a VAT to finance bigger government. Here are some passages from an article in the 1972 archives of Congressional Quarterly. President Nixon…asked both the Advisory Commission on Intergovernmental Relations and his Commission on School Finance, a group he appointed in 1970, to study and report on a proposal for a value added tax. …The tax had the advantages that…it yielded relatively large amounts of revenue. …Two major reasons were apparent for the Nixon administration’s consideration of a value added tax. The first was the condition of federal finances. …Projected costs of existing and proposed programs were expected to absorb all revenues from existing taxes and other sources. This meant that no new programs could be inaugurated without new taxes to finance them or reduction of existing programs to release funds. Though initially pledged for education, revenues from an expanding value added tax might provide future funding for other programs. My colleague, Chris Edwards, deserves credit for unearthing this disturbing bit of fiscal history. Here’s some of what he wrote about Nixon’s sinister effort. Richard Nixon appears to have been the first U.S. leader to push for a VAT, which is not surprising given that he was perhaps the most statist GOP president of the 20th century. …Thankfully, the Nixon proposal went nowhere in Congress, the ACIR came out against it, and it was dropped. America’s economy dodged a bullet. If Nixon had been successful, the rate would probably have soared over time from an initial 3 percent to maybe 20 percent today—just as rates in Europe have risen—and that would have fueled growth in new and expanded entitlement programs. Amen. Chris hits the nail on the head. It doesn’t really matter what the initial rate is. The VAT is an easy tax to raise because it’s so non-transparent. Moreover adopting a VAT is a sure-fire way of enabling higher income tax rates because the statists will say it’s “unfair” to raise the VAT burden on lower-income and middle-income taxpayers unless there’s a concomitant increase in the income tax burden on the evil rich. Which is exactly what happens in Europe. Look at how recent VAT hikes have been paired with higher income tax rates. But here’s the chart that should scare any sensible person. The bottom line is that the VAT is the Ebola Virus of big government. Call Cruz campaign as I did based on your 3 articles so far impugning Cruz for proposing a European-style VAT. Response is that Cruz proposal for business tax does NOT include the European features that open to Dimocrat/Socialist tax abuse. So why do you persist in the scare-mongering criticism? Pray, tell. Art Laffler rates Ted Cruz plan the best. To play devil’s advocate [and I do mean devil], Nixon was the one who said “We are all Keyenians now”. So he believed government spending was necessary to pull out of a recession. The VAT was introduced in Britain in 1973, so for Nixon it was the new hot tax. Nixon was a smart guy in many ways, but the “settled” economic theories of the time were against him. and the Germans are considering sending in the troops… to maintain order…. This post is from a libertarian perspective. It coincides with what I have been thinking about recently. Bernie Sanders wants for America to be more like Europe. My understanding, though, is that many countries of Europe finance their welfare state through a Value Added Tax, while keeping corporate taxes low. Sanders, however, often proposes to pay for the programs that he wants by taxing the rich. Can that even raise enough money, though? Empirical evidence is worth more than any analysis or political posturing. Implement VAT, become a country with a 1% growth trendline, in a world that grows by 4%, become a middle income country by 2060.